Once gutters become clogged, the excess water that pours down the sides of your home, instead of into the downspout as it should, begins to penetrate the walls and ceilings. This water can leave stained water marks along your outer walls and begin to rot the wood behind your home’s siding. In some cases, gutter overflow can reach basements where, if allowed to freeze, it can crack the foundation. Another problem with clogged gutters is that the leaves and other debris that collect in them absorb water, which puts unnecessary stress on the gutters and the brackets from which they hang. Plus, constant trapped water tends to rust metal gutters. When gutters fall off the house, they usually need to be replaced, which is unexpected expense for most homeowners. From a human health perspective, clogged gutters can harbor various disease-causing bacteria as well as promote mold and mildew to form along a home’s walls. Most experts agree that gutters should be cleaned twice per year, usually in the fall and spring. This leaves gutters free of debris and better able to handle winter precipitation. An exception to this guideline is when a homeowner lives in an area with pine trees, which shed frequently and bear needles year-round. In this case, the recommendation is three times per year. It is relatively simple to clean gutters, requiring little more than a ladder, trowel and bucket. However, if you are nervous about climbing a ladder, don’t have time for the project or would just prefer to avoid the hassle, there are many professional gutter cleaners available for hire who can usually accomplish the task relatively quickly. 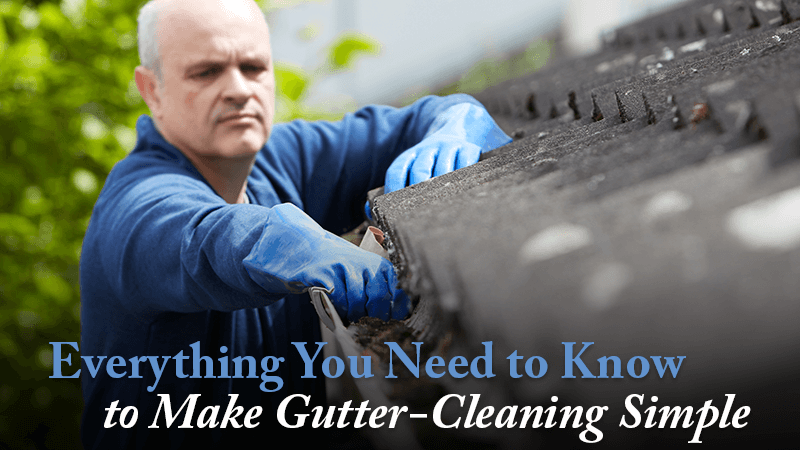 As you clean your gutters, examine their general condition. If they are rusty or bent out of shape, it’s time to replace them with gutters made of aluminum or other rust-proof materials. Although you should plan to pay more to replace gutters than to hire someone to clean them, bear in mind that many gutters come with 20-year warranties, which makes the initial investment worth the cost. Experts say well-maintained gutters can last as long as 30 years, protecting your home on various levels the entire time. Find all the home improvement materials and products you need at Mike Sikora’s Dayton Home Improvement. Our inventory includes gutters and downspouts, patio covers and enclosures, windows, shutters and more.